Our beautiful facilities are perfect for Weddings, Private Gatherings, Meetings, Special Events and Tournaments. Choose from lago, Jim and Garry's Pub or Gourmet Express Catering. Rates vary depending on the day of the week and time of year. Book conveniently online 24/7 or call the Golf Shop at 905-653-4653. All the benefits of a private club membership without the cost and restrictions. The Vaughan Citizen's Michael Hayakawa talks about the Score Golf Top 100 Golf Courses in Canada 2010, ranking Eagles Nest at 22nd. 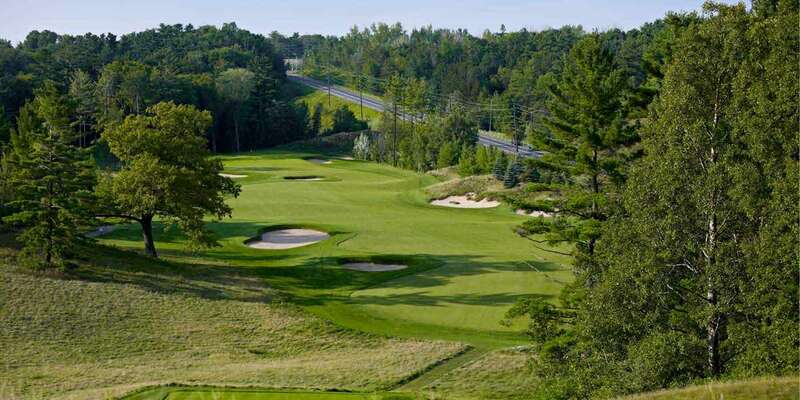 SCORE GOLF Magazine ranks the 10 Best Public Courses in Ontario. Eagles Nest comes in 3rd in all of Ontario, 1st in the GTA, 2nd in Southern Ontario, and wins the Toughest Challenge. SCORE GOLF Magazine ranks the top five public courses in Canada. Eagles Nest comes in 3rd. SCORE GOLF Magazine shares with us the 2008 Top 100 Golf Courses in Canada. Eagles Nest ranks at number 23. ONTARIO GOLF Magazine shares with us the 2007 top 50 courses in Ontario. Eagles Nest Golf sticks close to the top in the 8th spot. THE GLOBE AND MAIL's Stephen Ames plays Eagles Nest Golf Club. SCORE GOLF Magazine "The dream of a group of Toronto real estate developers, the majority of Eagles Nest was initially an old aggregate pit, with some natural rolling meadows and trees at the west. With largely a blank slate, Toronto designer Doug Carrick created an inland links with massive faux dunes, acres of fescue and crafty, rolling greens." TORONTO GOLF "When it came to first-place votes, more than half the panel (nine) gave Eagles Nest GC in Maple their NO.1 choice. No other layout recieved more than three first-place nods." THE TORONTO STAR "You could ask, 'What's a chef like you doing in a place like this?' After all, the chef is renowned among the downtown food crowd and the place he's in is surrounded by acres of land that are still being bulldozed for new semi-detached homes." GLOBE GOLF "Understated course architect Doug Carrick lets his work talk for him, and Eagles Nest makes a loud statement about his talents." ONTARIO GOLF "Rather than relying on dramatic scenery or a wilderness setting, Doug Carrick sculpted Eagles Nest GC to emulate the rugged dunes typically found on the linksland courses of Scotland and Ireland." THE GLOBE AND MAIL "Doug Carrick designed this public course, which opened on May 17 and charges a $190 green fee, and he has outdone himself. Magazines might as well hand the best new course award to Eagles Nest. It's hard to imagine anything better." FAIRWAYS "The city above Toronto will soar to new heights this spring when spectacular Eagles Nest Golf Club unveils its wings and ascends to its destiny as one of the country's best." TRAVEL AND LEISURE GOLF "An old sand and gravel extraction site, Eagles Nest has been transformed by the accomplished Canadian architect Doug Carrick into a compelling links-style track, its sand scars shaped to resemble eroded dunes." Copyright 2019 Innovasium Eagles Nest Golf Club Inc.